Low Carb Kentucky Bourbon Balls are perfect for your holiday cookie tray or a Kentucky Derby Party. 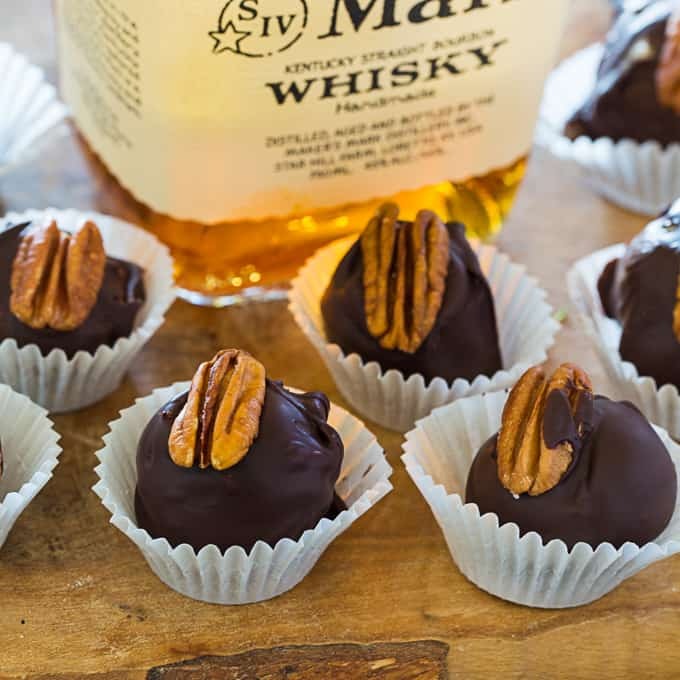 A combination of crunchy chopped pecans, chocolate, and bourbon make these candy balls a delicious southern sweet treat. 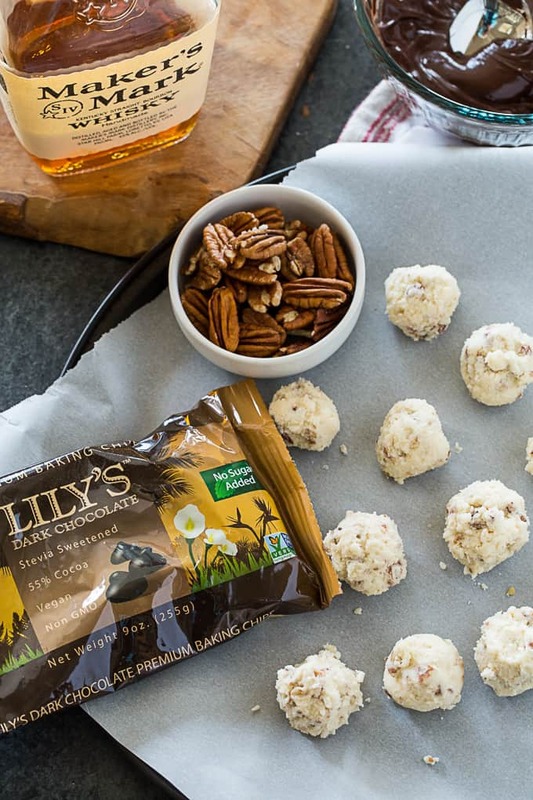 These bourbon balls are sugar-free, gluten-free, and keto-friendly. I love a no-bake dessert, especially one containing bourbon. 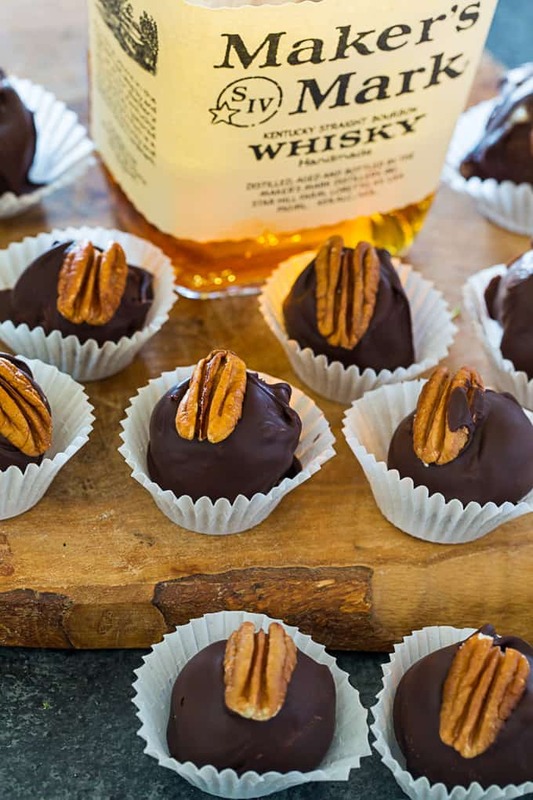 Since there is a hefty amount of bourbon in this recipe and it is not cooked off, these Low Carb Kentucky Bourbon Balls should be an adult-only treat. You’ll need Swerve Confectioners for the sweetness. If you can’t find it at the store it can be ordered online. It is great for making low carb frostings. For the chocolate chips I use Lily’s Sugar-Free Dark Chocolate Chips. They are sweetened with stevia. If you have difficulty getting the filling to form into balls, pop it back in the fridge or freezer for a few minutes. A small coffee mug is great for melting the chocolate. Use a toothpick or a fork to dip the balls in the chocolate. Bourbon Balls are even better the next day once all the flavors have a chance to blend and mellow. 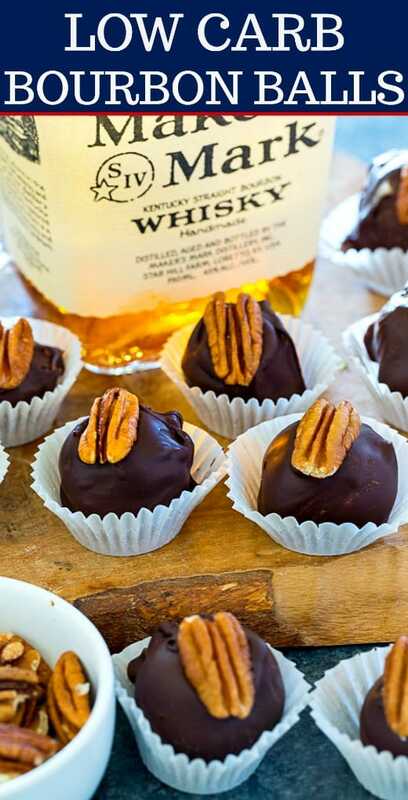 These bourbon balls can be stored in the refrigerator for about 10 days or frozen for up to 3 months. 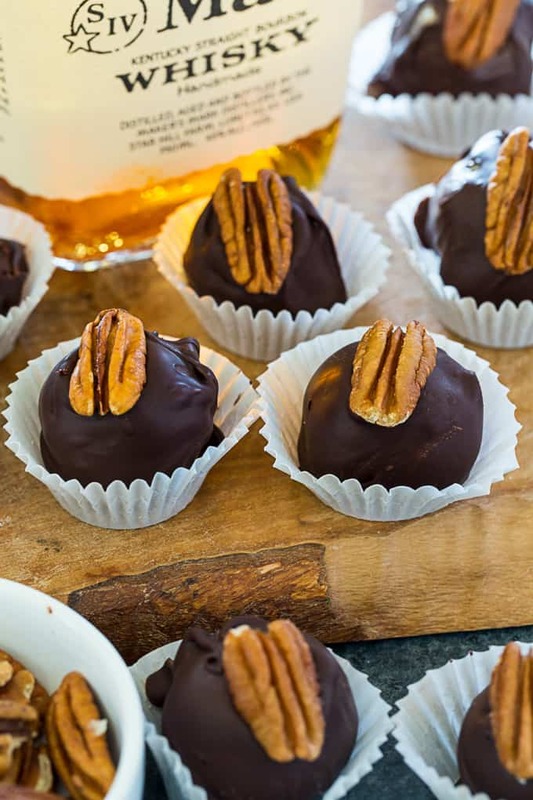 The combination of bourbon, pecans, and chocolate is absolutely amazing in these Low Carb Kentucky Bourbon Balls and they won’t ruin your keto diet. One bourbon ball has 1.o8 net carbs. Only 1.08 grams net carbs per Bourbon Ball! Place butter and erythritol in a large bowl and use a hand-held mixer to beat them until combined. Mix in the bourbon and vanilla extract. Mix in the chopped pecans. Refrigerate for 1 hour. Line a baking sheet with parchment paper. Shape mixture into 12 1-inch balls and place on parchment paper. Refrigerate for another hour. Place chococlate chips and avocado oil in a small microwave-safe bowl. Microwave at 30 second increments, stirring after each one, until melted. Using a fork or toothpick dip and coat each ball in the melted chocolate and return to parchment paper. Press a pecan half into the top of each one. Refrigerate for at least 30 minutes before serving. Serving size is one piece. For best results, use a quality bourbon. I like to use Maker's Mark. Nutritional info is provided as a guide only and can vary based on brands of products used and cooking and measuring methods used.